According to a post made on SEGA’s Twitter account on Friday during a giveaway event, the PS3 version of Sonic Adventure will be hitting PlayStation Network the same day as the Xbox 360 version, which was announced a couple of weeks ago to be available for download from September 15th on Xbox Live Marketplace. We are all out of shirts! Congrats to @evilslash13 and all our winners today! 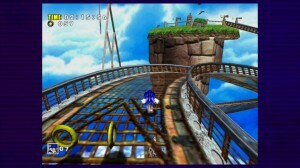 Reminder – Sonic Adventure on PSN / XBLA on 9/15/10! Will you be downloading this Dreamcast classic? Let us know in the comments. WOOOHOO! <<>> I will be! Yes! I will most certianly download this awesome game! Oh yeah I’ll be downloading this first day but I thought PSN only updates on tusedays? ^ The american PSN yes, but the european on wednesday. I already got the G-cube version, but I’m telling my friend about this! Told you it would do. Sony and MS differ greatly in when they confirm their online service release dates. i hope even though they say its gonna be released Wednesday, i hope it comes out on us psn on Tuesday when the store updates. I’ve got it on Dreamcast and GameCube, so no way am I buying an XBOX or a Playstation 3 for this. Fishing as Big the cat in HD. That’s the day I’m pre-ordering LittleBigPlanet 2, what a coincidence. So… not only do I (hopefully) get Phantasy Star Portable 2 for the PSP on that same day, but I’m also getting Sonic Adventure DX for the PSN as well? Double dose of awesome!! Does anyone know if any of the glitchiness has been cleared up? Will be downloading on the day!! Why would I waste money on a game I already have? Wonder what the achievements are? STAY OFF THE LIGHT SPEED! Gonna havta get all those missions once again. So, ill be downloading this on RELEASE on Wednesday. why is it so cheap? though it is old, and DLC stuff is usually less than a normal store game. …I give up. Where is it? is it only for ps3 or is it for psp also?